Those in the Australia / New Zealand part of the world are likely to be familiar with the words three thrityitis. It's a term used by the Continental cup-a-soup ad campaign in these countries to promote the drinking of their soup products at 3:30pm - the time of day when concentration in the work place hits a low. It may not be the exact time of day for everyone, but it's in that mid-afternoon slot where things just seem to slow down and mistakes are often made. One time I saw it in effect was a few years ago when I was getting my degree framed. It was a Thursday afternoon and I was at my desk when my cellphone started ringing. I answered and was greeted by the voice of a young lady ringing to let me know that my degree had been framed and I could pick it up from their shop. Her: Oh, but we'll be closing early in the afternoon on Saturday, so don't come in tomorrow." Me: Tomorrow? Tomorrow's Friday. You're still open on Friday right? Her: Huh? Oh whoops, yes you can come in tomorrow. The closing stuff was meant for Saturday. After that phone call was over, I took a look at the time: 3:38pm. Roughly 3:30-itis time. I went to pick up my framed degree the following day. I was so excited about it I almost went to buy the person who called me some of that Continental Cup-a-soup stuff, as both a thank you and a joke. Nowadays I face a different sort of battle at around 3:30: staving-off sleep. We learn that eating large meals can make you sleepy. I learned this lesson during my university years, where I would eat lunch on campus. I never brought my own food, so I would eat from the places that were on campus, which weren't always serving the healthiest food options available. Most importantly (but I didn't know it then) was that it was the stuff that I was choosing to eat and the amounts of it which made me fall asleep faster. So there I was, eating too much of the kind of food that would in lesser amounts still easily knock me unconscious. 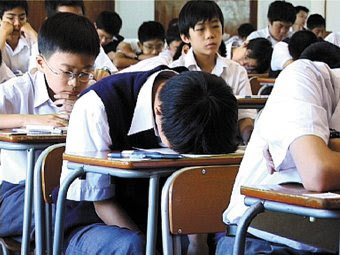 During my first year at university, I was lucky enough to not have too many classes too close to lunch time, but when I did, I was often drowsy and using all of my remaining concentration from keeping my eyelids from closing. All I needed was a 15 minute nap, and on the occasions that I did succumb to slumber, at the end of it I would feel great and refreshed. The problem lay in the lead-up to the nap where I sometimes spent 20 minutes trying to not fall asleep. 20 minutes fighting sleep + 15 minutes sleeping = most of the lecture gone. To fight this problem in second year, I went to my friends' psychology lecture which was sandwiched between lunch and my afternoon classes. It was a big class, so 1 more person - particularly one who doesn't take psychology - wouldn't be noticed. There, I would sit with them, lay my head on the desk, and fall asleep. This didn't always work however. 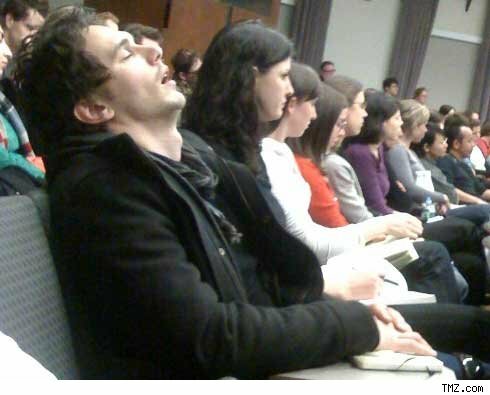 I often found the psychology lectures quite interesting and at times stayed awake throughout the entire thing to learn a little. One time, they even brought in a hypnotist! That was cool. Suffice it to say, this wasn't my most successful solution to the sleepiness problem. In my 3rd year, I tried to get a nap on the couches in this common area where my friends would often hang out. It was a bit noisy, so naps weren't always easy to come by. In my 4th and final year, the 4th year BIT (Bachelor of Information Technology) students had their own computer lab, and there I would eat my lunch, and then take a nice nap afterwards. It was a relatively quiet environment, so sleep was easy to come by. It was the best solution I had come up with. Unfortunately, I can't replicate this solution at my work. If I happen to make the silly mistake of eating too much for lunch and then have an afternoon with either not much to do or with a task that really isn't all that engaging, then the drowsiness starts to return, and I find it hard to fight back. Once, I had been caught-out by my team leader, and on a few occasions my work mates have jolted me awake, either by coming up to me and saying something loudly, or ringing my phone. If I do eat too much sugars (carbohydrates and what not) I can get hypoglycaemic quite easily due to the over-abundance of insulin my body makes. I'm like an anti-diabetic according to my diabetic friend, but am still susceptible to the same problems she faces if she doesn't watch what she eats. The thing is, she's the one that takes the insulin shots; all I have to do is alter my diet - smaller meals more often, don't chow-down the carbs at lunch, etc - so I feel quite bad when I make the mistake and eat too much at lunch and then start feeling drowsy afterwards. Now that I do know a diabetic, I feel I'm not doing the best I can with the luck I've been given, and so berate myself every time this happens. I really have to fix this and stick with it; if not for the approval of my diabetic friend, then for my own well-being. Next: Static shocks, my online diary, and the end of Blog Every Day April. OH MY!